Orzo, that tiny little rice-shaped pasta, is a big hit with kids. I love to throw it into vegetable soups or toss some with butter, Parmesan cheese, lemon zest, and freshly chopped parsley for an easy side dish. If you're looking for an easy pasta recipe, you'll love this creamy, delicious one that can be made in just minutes. It's the perfect side dish or, add cooked chicken and it becomes an easy dinner! Variations: toss in broccoli or broccolini in place of the spinach; add sautéed shrimp or chicken for a full meal. Bring a large pot of salted water to the boil. Cook the orzo according to package directions. Drain and reserve. While the orzo is cooking, wilt the spinach in a large pot. If the spinach is still wet from washing, there should be no need for additional water. If it’s dry, add ¼ cup water to the pan. Cover and wilt. Drain spinach in a colander. When cool enough to handle, squeeze out excess water. Finely chop. In the same pan, heat the olive oil over medium heat. Add the garlic and cook until aromatic, about 30 seconds. 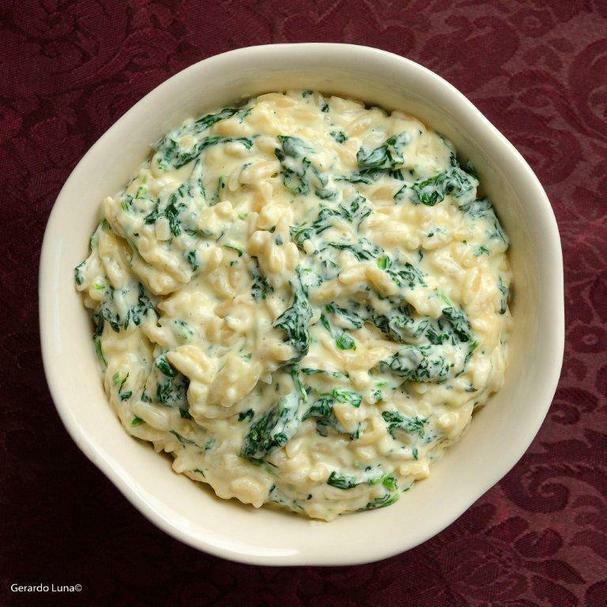 Toss in the spinach, orzo, cheese and cream. Heat until the cheese has melted and everything is hot.